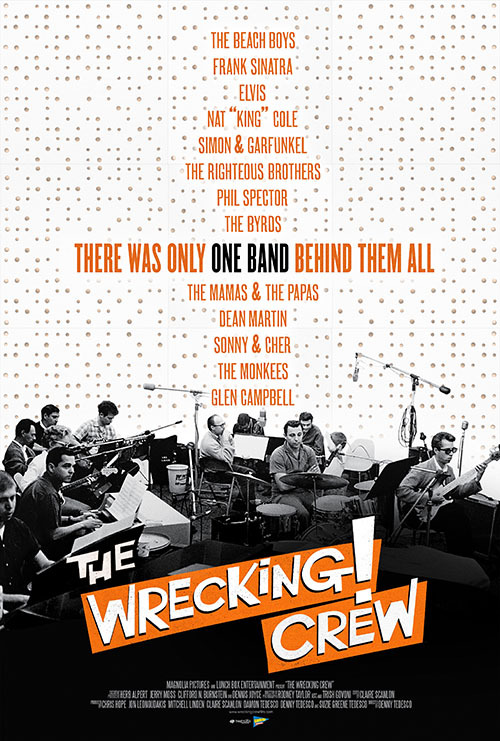 On the heels of 20 Feet From Stardom, comes The Wrecking Crew, another documentary about the unsung heroes behind popular music. In this case, the titular musicians were an amorphous group of session musicians in Los Angeles in the Sixties. Directed by Denny Tedesco, the son of Wrecking Crew guitarist Tommy Tedesco, the film plays like a loving tribute to a father by his son. This isn’t a bad thing, but the film acts more of a cursory overview of the time period rather than a deep dive into why these musicians had such an impact on the industry, other than that they were consistently very good. Nor does it take the time to explain how musicians like Herb Alpert or Glen Campbell managed to break out into being successful artists in their own right. Very upbeat and positive, the film barely even raises the subject about whether or not these musicians should have been credited for their contributions. Mostly taking the form of talking head interviews and occasional archival footage and round tables, the highlights here are Brian Wilson, Cher, and Carol Kaye. The only female musician in this group, Kaye not only gives great insight into being a woman in a “man’s world,” but is also the most lively interview subject, usually with bass guitar in hand, illustrating her points with musical examples played right on the spot. Much more of a tribute than call to awareness, The Wrecking Crew is still a must-see for fans of classic pop, which should be everyone. The Wrecking Crew opens today at the Ritz Bourse.